Is it just a Scary Haunted House or the birthplace of your childhood fears? For 11 years now, Scream Works has had its possessive grip over Fear Factory’s main event, the Haunted House! 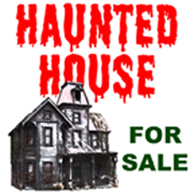 Place yourself inside of one the most renowned scary Haunted House as is manipulates your mind and sends you into an eye rotting delirium. This psychosis will have you seeing body bags, bugs and many of the scary Haunted House residents’. Find out why many can’t get past the kitchen… and it’s just the first room! Don’t let the creaks and gasps of air give you away. Be aware of yourselves as your presence is very well known inside. The owners of this scary Haunted House have quite the fixation and excitement to show around new guests, for their hopes is that you may stay as their new friends. Be part of the masterpiece when you explore the cruel tendencies the Fear Factory’s scary Haunted House has to offer. As each member of our family has its own gift to cultivate your mind into a victim...I mean friend. Each room has the typical bedroom, bathroom, nursery and other rooms of the house. However, it’s never a home until you make it your own. Our babe of the house, Finger Foods, has always had issues with teething, so don’t look at her hands! Many other members of our family are unable to control their thrills in seeing visitors, but we’ve learned it’s the thought that counts. Despite our lack of self control we have everything inside to offer a guest to rest in peace. As dysfunctional as our family may be, what family isn’t? We have been the offenders to many childhood stemmed fears for 11 years now and we can’t wait to make you part of them. We take pride in our scares and contorted visions of the modern world today. We do not seek judgment day as it already has shown us our true living in this life. We have no fears, we just provide them. For newcomers, this synopsis sheds light on what the dark will not allow you to see in the scary Haunted House. As for the rest of it, that is for you to interpret on your own. Don’t just make this as another affliction at Scream Works but embrace the opportunity it gives you to be part of something bigger. Something better than going out for a night. An experience of what you cant see or feel in daylight. Embrace the dark diabolical side that leaves you shuddering with your last pieces of excitement and breath this Halloween season the way it was intended to.